Start the year with a bunch more in your pocket. January is that 1 month that tends to feel like 3. Financially speaking, of course. We can all agree that there’s nothing like a rough month to make 4 weeks feel like forever. It just keeps going on and on and on… That’s just no way to start the year. 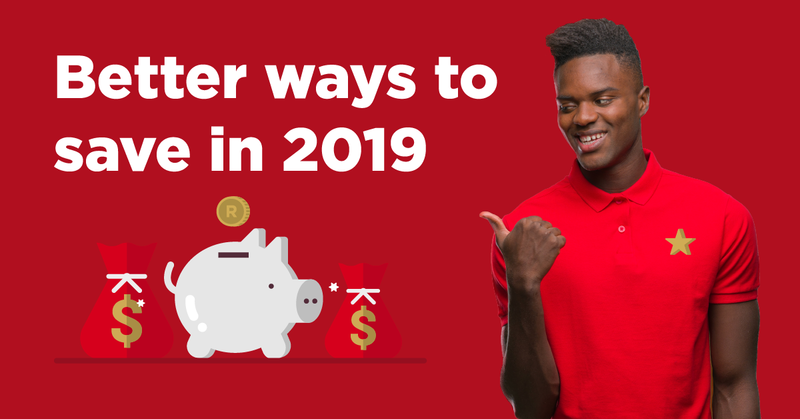 What you need, is a 2019 savings strategy that you can work into your lifestyle so that it’s easy peasy to stick to your budget. Here’s a list of ways to start saving money today. Some of these tips are big and some are small, but together, they’ll help you keep more cash in the bank. A big glug of H₂O helps you stay fuller so that you don’t go all gaga over the biggest and most expensive dish on the menu. It might sound a bit cheap, but there’s nothing wrong with that! Plus, it means that you still get to go out on the odd occasion… Which is a luxury in this economy. You’ll also feel better because of all those magical things that drinking water does for your body. We call that a win-win-ka-ching. Movies and treats are starting to cost the earth. And that’s just for the kids, never mind what it costs for the whole family. If you’ve got the spare cash, then go on and splurge. There’s always a time and a place for some pricey fun. But nowadays, those times and places are few and far between, especially when you’re actively trying to save money. With a little ingenuity, you can find heaps of cheap ways to entertain your family. Just give it a Google and surprise yourself and your family. Things get scratched, buttons fly off shirts, and chips happen. Don’t toss things out on a whim if they can be repaired. Take clothes, for instance. Patch your pants, sew a new button on, and darn your holey socks. Basic repairs like these are a great way to extend the life of your goodies and put more pennies back into your pocket. Did you know that you’ve probably got a treasure trove sitting right in your house? Go through your drawers, closets, and various junk holes to find anything and everything you no longer use. Once you’ve sorted through everything that’s of value and given it a decent once over, you can sell your once loved possessions. The opportunities to sell these items are endless. You’ve got your garden variety yard sale, Gumtree, OLX, and other online sites. Certain recreational items come in 2 forms. The ‘buy it on the regular’ type and the ‘meatier, longer lasting’ type. For instance, you can buy a magazine every week or buy a bulkier monthly or bi-monthly magazine. Sure, the bigger 1s are a little pricier, but you can enjoy it for much longer and ultimately spend less. All of these tips so far have shown you ways to save slowly. But here’s 1 that’s a lot bigger and will help you save every single month, without fail. And you don’t even have to do anything, because the king will do it for you. All you have to do is switch to super cheap car insurance. You see, the king’s decreasing premiums are specifically linked to your car’s value to make sure that you consistently pay a premium that’s in line with what your car is worth. Automatically and without hassle. See? It just makes sense to get our royal touch in your life. Get a quick quote here or call our royal client care team on 0860 50 50 50.